I wrote a quick post about the #QantasLuxury social media disaster as it was happening the other day, and I’ve since read a number of perspectives on it – ranging from the opinion that it was exactly what Qantas wanted to happen to the dominant view that it was an epic social media fail. What I love about most of the commentary is that it is written from the perspective that you can exert some form of control over social media, and manipulate it to your own ends. That’s a fundamentally flawed position, but one that comes from the prevailing desire that most marketers have to control the channels they use to promote their companies’ branding and messaging. In the Havard Business Review blog post I linked to above, Alexandra Samuel writes about ‘a social media team’s desire to “own” this new channel’ – and that’s a big mistake. The only channels you can truly ‘own’ are the ones over which you have complete control. 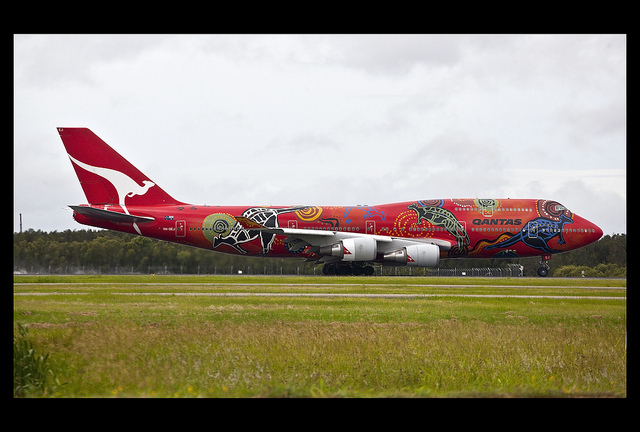 These includes advertising, direct mail, your people, and your own physical (like the fantastic painted Qantas plane pictured above) and digital properties. They do not include traditional media, social media or public opinion. When you try to apply conventional marketing strategies to the channels that you don’t own, that’s when things become unstuck. The most important marketing activity you can perform as an organisation is to tell your own story as well (and as consistently) as you possibly can to your range of stakeholders. That’s going to involve subtle changes in the message to suit different channels and audiences, and at times to take the decision to avoid or limit your activities on those channels where you have very little ‘ownership’. My initial thoughts about #QantasLuxury were that Qantas should keep its head down and focus on the channels where it can completely control the corporate image – and I still believe that would have been the best course of action. If you think about it in PR terms, you’re not likely to pitch a story to the journalist who is openly hostile or antagonistic towards your organisation, unless you truly believe that you have a good chance of changing their opinion. It’s the same thing, but on a larger scale in social media. If you have a community against you, think really carefully before you pitch a story to them, because they will take it and run with it in a way that can be damaging to your organisation’s brand and reputation. And, given that you don’t own social media, you can’t stop them.